Saturday marks 10 years since the first Free Comic Book Day, and as with last year, I'll be signing my Star Wars, Mass Effect, and Iron Man comics at Chimera Hobby Shop, 808 W. Wisconsin Ave., Appleton, Wis. from 11:00AM to 1:00PM, and again from 3:00PM to 6:00PM. I think it's the seventh or eighth straight year I've participated at a local shop here, and I'm glad to take part. It's very important to the business, and it's become a model for other hobbies. It's a tradition — and so in something else that's become a tradition here, I'm retelling the story of how an event which began with a suggestion by a retailer in the pages of a trade magazine has become a major happening in stores around the world, and the kickoff not just for the summer but most of the comic book year for many publishers. There had been earlier hopes for an equivalent to the milk marketing board in comics — some kind of advertising council — over the years, including a publisher-and-distributor attempt in the mid-1990s that met several times but never generated much of anything before it vanished in the industry's collapse that decade. The idea for Free Comic Book Day, by contrast, came from the retail sector — or, rather, from a retailer: Joe Field, owner of Flying Colors Comics in California. I had signed Joe on in the late 1990s as a monthly columnist for Comics & Games Retailer magazine, a trade publication that went for free each month to most of the comics shops in North America. 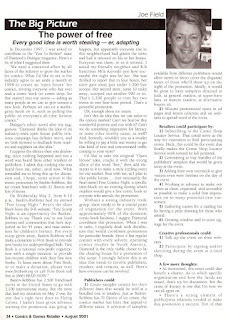 Like the other columnists, Joe's contributions ranged from commentary on retail issues to practical advice — and in June 2001, just as the comics industry was beginning to emerge from the disaster of the 1990s, Joe advised us he had a special column on the way, along with something unusual: an instantaneous response from the Powers That Be being addressed. In "The Power of Free," Joe spoke of how Baskin-Robbins had held its annual Free Scoop Night on May 2, 2001. The event resulted, he wrote, in the ice cream store near his shop moving 1,300 scoops in four hours, meaning that's how many patrons came through the door. Joe wrote that he'd suggested a national comics "open house" event to Diamond Comic Distributors in 1997; now, he thought, the key element to add would be giveaway comics. Giveaway comics were a major source of new readers for the comics industry over its history, from the March of Comics issues given away at shoe stores to the Big Boy comics still distributed in restaurants. I've done a lot of research into those and several other giveaway lines over the years — and it's plain that many of the people who learned to read comics (and, odd as it sounds, the storytelling language of comics is something one does have to learn to read) learned it from ones they got for free. Most of those comics went completely away in the 1980s and 1990s. Joe's suggestion in the article was that publishers could create sampler comics for their different lines — "just as Baskin-Robbins has 31 flavors of ice cream... a selection of samplers available from different publishers would allow stores to better cover the disparate tastes of those who'll show up." Joe suggested a variety of steps that could be taken by publishers, retailers, and creators; I've posted the original article pages here, which I hope he doesn't mind. Click the pages to see them larger. It shows that many of those ideas, relating to the production and distribution of the samplers, were pretty close to what was eventually adopted. 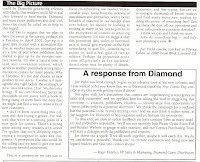 It also shows the sidebar response from Diamond's Roger Fletcher, embracing the idea and promising to solicit retailer interest in the idea. And it happened. The first Free Comic Book Day was on May 4 of the following year — right after the release of Spider-Man, and a year and two days after the Baskin-Robbins event that Joe said provided the partial inspiration. The magazine followed the progress of the event, and was happy to be associated — our Maggie Thompson attended many of the FCBD board meetings as an advisor. But it all came from Joe — and Diamond and the major publishers' evident agreement that, as he had written, 2001 was the beginning of a turnaround for comics, a new opportunity. "There's a strong sense among many retailers with whom I've spoken that we're definitely experiencing a resurgence of sales and customers," he wrote. "A promotion like this could be the calling card we need to give our market strong forward momentum." And it did. A few years later, both the sportscard and gaming hobbies put together similar events, organizers citing the FCBD experience as a positive reason to go forward. And FCBD still goes forward.